The Country Porch features the Outhouse Bathroom Collection of bath decorating accessories from Park Designs. 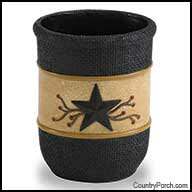 Features a black burlap texture and embroidered wit forged star accessories. Pair with our extensive selection of shower curtains and bath hardware.